I discovered CORE Fitness on February 15th 2010. I went into the studio with my sister to start what I thought was a boot camp. My first encounter with Michele was painful. At 216lbs and 44% body fat, let’s just say I was surprised I didn’t leave in an ambulance. February 17th was my first day of the rest of my life, I started 4 times a week in with personal training, and it was the best decision I made. Michele pushed me hard, the more I complained the more she would push, not because of the complaining but because she saw something in me that I was yet to discover. A will to live, a will to change, the will to be the best I can be. 2010 was a year of transition for me, and one of the hardest years I ever faced, but Michele was an amazing part of getting me through it. I always said she went above and beyond what a personal trainer should be, and that made me even more excited to work out. I had many goals during my journey, to be a size 8, to be 140lbs and to run a 5k. 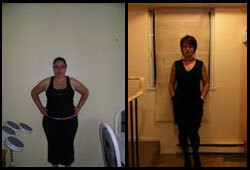 By July 2010, I was 159 lbs, a size 10 and on October 2010 I ran my first 5k in 28 minutes. I never thought I would be doing the things I am doing, and CORE Fitness and Michele are a great part of my accomplishments. Today I am 146lbs, and a size 5, my body fat is 28% and I am training to run my second 5k and cut my time by 8 min… I am hooked on CORE and I am forever grateful that when I walked into that studio more than a year ago Michele saw the person behind the fat body and pushed me to discover who that woman was. I am a new woman… a new mother, and it feels so good to get to the top of the stairs and not feel like you are about to die. So if you want change, and want to discover who you are, I suggest you try CORE Studios, their team is amazing, they have amazing trainers and they will work with you so you can reach your goals. Thank you for pushing me and continuing to push me beyond my limits. My children thank you.